I have had many putting lessons, given many more putting lessons, played with some of the best putters in the world, and watched the best putters in competition. Each experience has added a little bit more to my knowledge and understanding of what it take to be a good putter. However a three minute putting lesson in Palm Springs in 1973 precisely summed up what the objective and thought process that is needed to be a good putter. The short lesson took place on the putting green at Tamarisk Country Club after I had taken a golf lesson from Angel de la Torre. I wanted to have Angel take a look at my putting stroke and see if there was anything to improve. He put a ball about 10 feet from the hole and I went through my preparation and stroked a well struck putt that rolled smoothly and evenly that barely missed the cup on the right. He then gave me another ball and I proceeded to stoke an equally good putt that barely missed the cup on the left side. What he said next floored me with its simplicity and accuracy. He said, "Why didn't you just putt it into the hole." What I realized immediately was that although I did aim, what I really did was try to make a perfect stroke. He went on to talk about a precise aim point, visualization of line, and distance control, but emphasized those are secondary to your main objective and concentrated attention was to putt the ball in the hole. I had a wonderful member of Lakewood Country Club in Colorado, who I would take to many Pro-Am's, first because he was a good guy and second he had a 20 handicap, but hit the ball much better than his handicap. However his short game and particularly his putting was very erratic. He was not a sure bet to make it from a foot! His profession was in computer science and he was very regimented and needed everything in place and exact. He played golf the same way and always did the same routine. He was the opposite of a "feel" player. So after a particularly poor putting performance the day before, I decided Ken needed a putting lesson. So we went on the putting green and I challenged him to a nine hole putting contest. He did his usual routine and preparation and I putted one-handed standing sideways and took no time to line up or aim. After nine holes I had beaten him by two strokes. I emphasized that he needed a different approach and be more feel and visually oriented. That was like I took away his security blanket. The order in the world no longer made sense and he was really uncomfortable. He understood and gave it a try. His controlling tendencies made the first couple of days very difficult. Giving up control just shouldn't work for a computer science wiz that believes everything must have order and symmetry. Every miss was blamed on a mechanical flaw. After the first week, he was noticeably better, but unconvinced and still uncomfortable. Ultimately he (not me) settled on a compromise that was 75% mechanical and 25% visual. Not what I would recommend, but he at least he got a little more feel in his short game and it resulted in lowering his handicap. On the other end of the spectrum is a player that I play with occasionally in Sedona. He is a pretty good putter that technically does most things wrong. He aims his putter well to the left of the hole, his shoulders and feet are off line, his putter doesn't follow a good arc, his body moves noticeably, and he stabs his putter at the ball. But he rarely three putts and makes a higher percentage of putts then you would expect. Bad mechanics, but he is just putting the ball in the cup. I have been a good putter my whole life. A good putter makes putts that are expected of you to make and putts that you need to make. I have learned a great deal from the good to great putters that I have played with over the years. There is a certain quiet confidence that goes with how they go about their business. Great putters are immersed in the whole experience. There is a flow to their routine. I can generally know if a player is a good putter by how he holds the club, positions his body, and surveys his putt. Putting has a great deal of mechanical and technical aspects to it, but ultimately it is an art form. Your putting stroke is like a finely tuned racecar. Strive to get it working smoothly and efficiently for maximum performance. Once ready for action you no longer have to worry about the firing order of the pistons or the suspension of the front axle, you just drive the car. 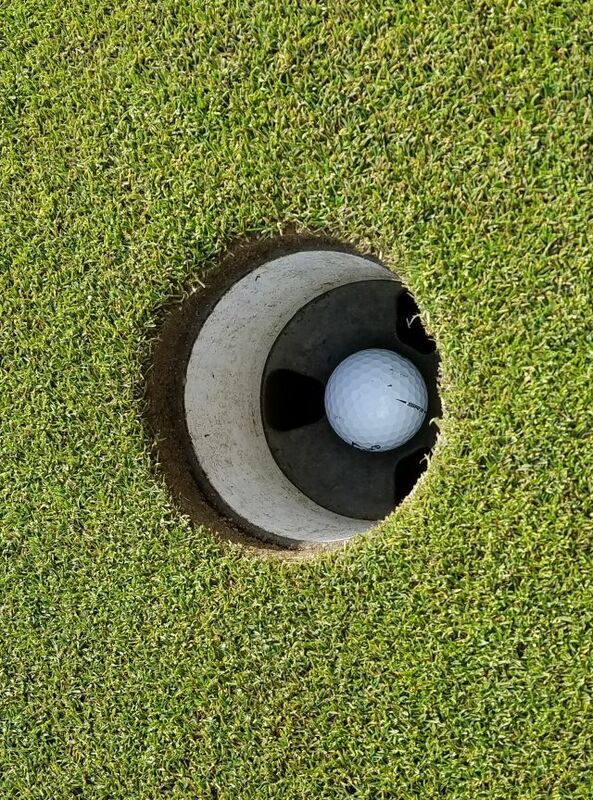 In putting, you trust your technique and putt the ball in the hole, simple as that. Get past trying to make a perfect stroke and visualize the ball going in the hole and you will be surprised how less stressful putting can be and how enjoyable it will be again.